The Joint platform of Central Trade Unions (CTUs) of the Country along with Independent National Federations of employees of different industries and services including Confederation of Central Govt. 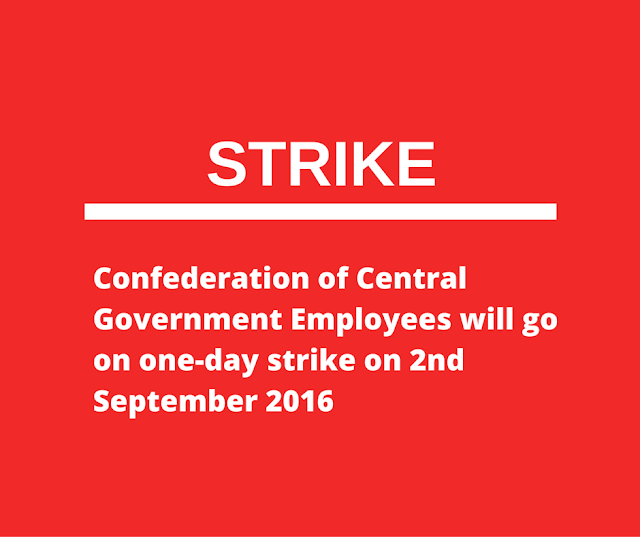 Employees and Workers, have decided to organize All India General Strike on 2nd September 2016, against the anti-people, anti-workers policies and authoritarian attitude of the NDA Government. Intensive campaign and preparation to make the general strike a resounding historical success is going on in full swing throughout the country. The attitude of the NDA Government is profoundly negative and hugely challenging to the working class including Central Govt. employees. 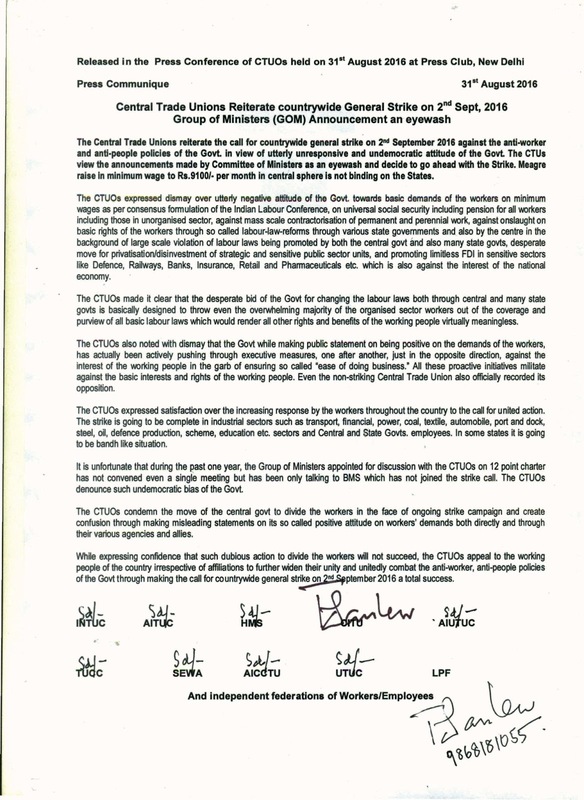 The issues in the Charter of demands submitted by the Trade Unions to the Govt. relate to basic interest of the country’s economy and also issues concerning the livelihood of the working people of both organized and unorganized sectors. Govt. has not taken any meaningful step to curb price rise of essential commodities and to generate employment except making tall baseless claims. Govt. is mysteriously silent on the question of retrieving the black money stashed abroad and recovering lakhs of crores of rupees of bad debts of public sector banks. Whole range of social security measures are under severe attacks including the pension of post – 2004 entrants in Central Govt. Services. Govt. has launched atrocious attack of drastic cut in interest on small savings deposits. Totally ignoring the united opposition of the working class, the Govt. has been moving fast to demolish existing labour laws thereby empowering the employers with unfettered rights to “hire and fire” and stripping the workers and trade union of all their rights and protection provided in laws. Alongwith the peasantry and agri- labourers are also under severe attack. Attack on public sector has been pushed to unprecedented height with Govt. announcing mega strategic sale and also allowing unlimited FDI in strategic sectors like Railways, Defence and financial Sector as complimentary to the move of privatization and Public Private partnership etc. The anti-worker and authoritarian attitude of the Government is also nakedely reflected in their refusal to implement the consensus recommendations of 43rd, 44th and 45th Indian Labour Conference for formulations of minimum wages, equal wage and benefits of regular workers to the Contract workers. The neo-liberal economic policies pursued by the Govt. has landed the entire national economy in distress and decline affecting the working people the most. The policy offensives of the Govt. like downsizing, outsourcing, contractorisation, corporatization and privatization has affected the Central Govt. departments and employees in a worst manner. Ban on creation of new posts and non-filling up of about six lakhs vacant posts had increased the work load of the existing employees and adversely affected the efficiency of the services. The New Pension Scheme (NPS) implemented with affect from 01.01.2004, is nothing but a “No Pension Scheme”, as it is fully dependent on the vagaries of share market forces. The Govt. is not ready to grant civil servant status to Gramin Dak Sevaks and to regularize the services of causal, contingent and contract workers. The 5% ceiling on compassionate appointment is not yet removed. The bonus ceiling enhancement from Rs.3500/- to Rs. 7000/- is not made applicable to Central Govt. Employees. Govt. is not ready to modify the 7th CPC recommendations, which is worst ever made by any pay commissions. The assurance given to the staff side regarding enhancement minimum pay and fitment formula is yet to be implemented. All other retrograde recommendations like reduction in the percentage of HRA, abolition of 52 allowances etc. are yet to be modified. Overall the attitude of the Modi Govt. is totally negative towards the Central Govt. employees and pensioners. The National Secretariat is of the firm opinion that unless the policy of the Govt. is changed, more attacks are likely to come on the Central Govt. employees and working class. To change the policy the united struggle of entire working class is required. It is in this background the Confederation of Central Govt. employees and workers has decided to join the General Strike along with other sections of the working class of our country. 1. Urgent measures for containing price rise through universalization of public distribution system and banning speculative trade in commodity market. 2. Containing unemployment through concrete measures for employment generation. 3. Strict enforcement of all basic labour laws without any exception or exemption and stringent punitive measures for violation of labour laws. 4. Universal social security cover for all workers. 5. Minimum wage of not less than 18000/- per month with provisions of indexation (for unskilled worker). 6. Assured enhanced pension not less than 3000 p.m for the entire working population (including unorganized sector workers). 7. Stoppage of disinvestment in Central/state public sector undertakings. 8. Stoppage of contractorisation in permanent/perennial work and payment of same wage and benefits for contract workers as that of regular workers for the same and similar work. 9. 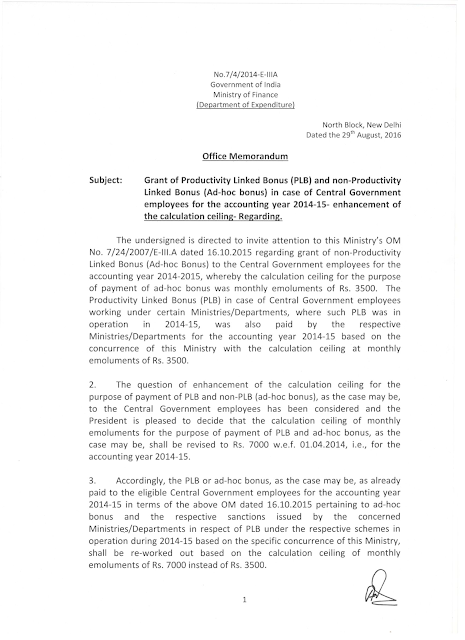 Removal of all ceilings on payment and eligibility of bonus, provident fund and increase in quantum of gratuity. 10.Compulsory registration of trade unions within a period of 45 days from the date of submitting application and immediate ratification of ILO conventions C-87 and C-98. 11.No FDI in Railways, Defence and other strategic sectors. 12.No unilateral amendment to labour laws. 1. Avoid delay in implementing the assurances given by Group of Ministers to NJCA on 30thJune 2016, especially increase in minimum pay a fitment formula. Implement the assurance in a time bound manner. 2. Settle issues raised by the NJCA, regarding modifications of the 7th CPC recommendations, submitted to Cabinet Secretary on 10th December 2015. 3. Scrap PFRDA Act and New Pension System (NPS) and grant Pension/Family Pension to all Central Government employees under CCS (Pension) Rules 1972. 4. No privatization, outsourcing, contractorisation of Government functions. 5. (i) Treat Gramin Dak Sevaks as Civil Servants and extend all benefits on pay, pension and allownaces of departmental employees. (ii) Regularise casual, contract, contingent and daily rated workers and grant equal pay and other benefits. 6. Fill up all vacant posts by special recruitment. Lift ban on creation of new posts. 7. Remove ceiling on compassionate appointments. 8. 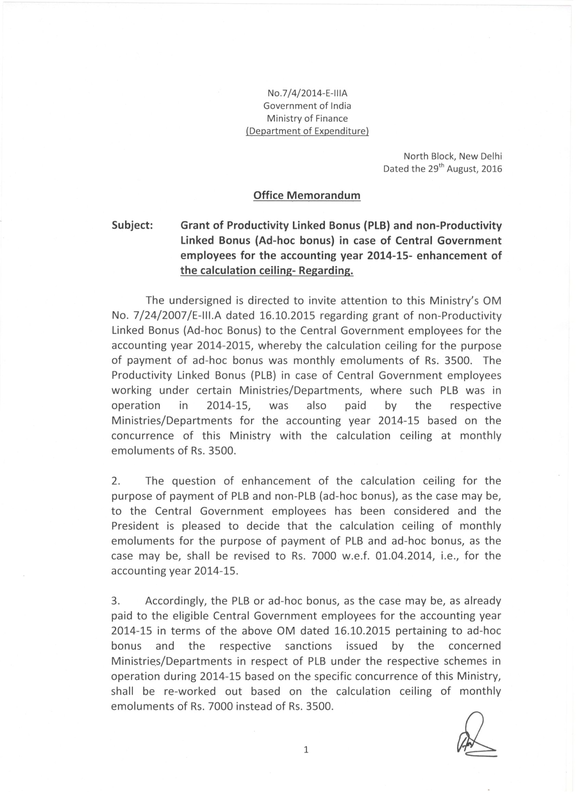 Extend benefit of Bonus Act amendment 2015 on enhancement of payment ceiling to the Adhoc bonus/PLB of Central Govt. employees with effect from the financial years 2014-15. Ensure payment of revised bonus before Pooja holidays. 9. Revive JCM functioning at all levels. All affiliated organisations and C-O-Cs are requested to plan phased campaign programme during the month of August 2016 by conducting squad work, general body meetings, conventions, and printing and circulating notices, pamphlets and posters. 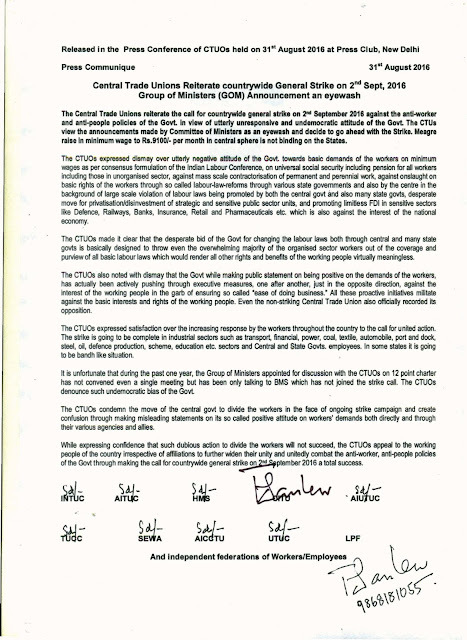 Each affiliated organization should issue their own separate circulars and instructions to all their units endorsing the decision of the Confederation National Secretariat. Go Ahead! Organise the 2nd Septermber Strike in full swing!! More than 20 Crores of Workers will participate in the Strike. No change in Strike Decision.Please do not believe rumours. Make all efforts to ensure 100% participation of Central Government Employees. 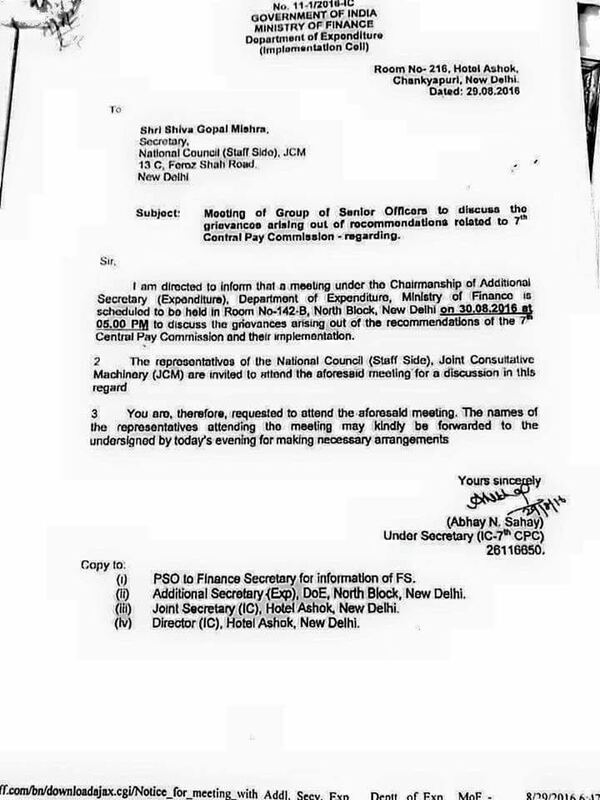 Meeting of Group of Senior Officers to discuss the grievances arising out of recommendations related to 7th Central Pay Commission - reg. Bonus ceiling raised to Rs.7000/- from Rs.3500/- with effect from 01.04.2014 – orders issued. Earlier Gratuity order for NPS pensioners issued. Intensify campaign & make the 2nd September 2016 strike a thundering success. Government Understands the language of struggle and strike only. Subject: Extension of benefit of Retirement Gratuity and Death Gratuity to the Central Government Employees covered by new Defined Contribution Pension System (National Pension System) – regarding. The undersigned is directed to say that the pension of the Government servants appointed on or after 1.1.2004 is regulated by the new Defined Contribution Pension System (known as National Pension System), notified by the Ministry of Finance (Department of Economic Affairs) vide their O.M. No. 5/7/2003-ECB & PR dated 22.12.2003. Orders were issued for payment of gratuity on provisional basis in respect of employees covered under National Pension System on their retirement from Government service on invalidation or death in service, vide this Department’s O.M. No. 38/41/2006-P&PW(A) dated 5.5.2009. 2. The issue of grant of gratuity in respect of government employees covered by the National Pension System has been under consideration of the Government. It has been decided that the government employees covered by National Pension System shall be eligible for benefit of ‘Retirement gratuity and Death gratuity’ on the same terms and conditions, as are applicable to employees covered by Central Civil Service (Pension) Rulke,1972. 3. These orders issue with the concurrence of Ministry of Finance, Department of Expenditure, vide their .D. Note No. 1(4)/EV/2006-II dated 29.07.2016. 4. 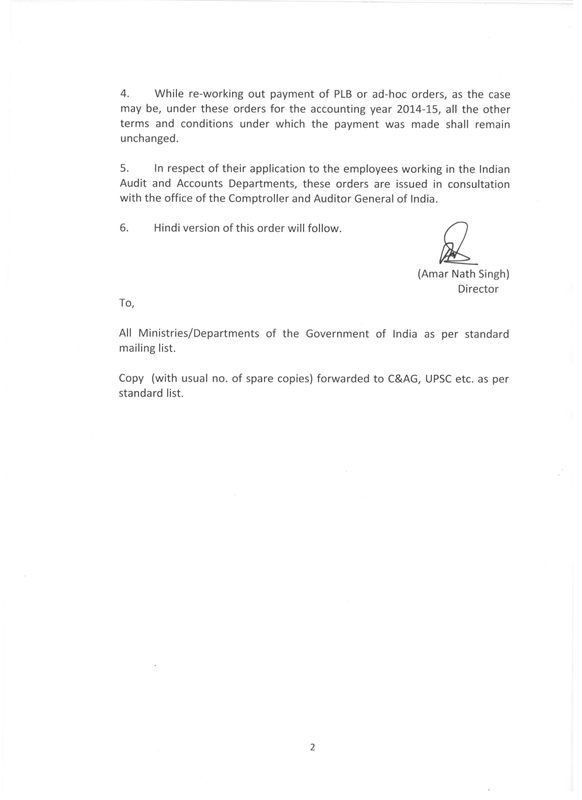 In their application to the persons belonging to the India Audit and Accounts Department, these orders issue after consultation with Comptroller and Auditor General of India.